Panel members in photo (L-R): Mr. Armando Bartolome, Ms. Linda Stone, Dr. Ed Arcinue, Mr. Eduardo Romualdo with DTI Trade Commissioner Celynne Layug (standing). MAKATI CITY – The Department of Trade and Industry through its Philippine Trade and Investment Center Los Angeles (PTIC-LA) in cooperation with the Philippine Consulate General and Philippine Department of Tourism in Los Angeles officially launched the Trabaho, Negosyo, Kabuhayan (TNK) workshop for Overseas Filipino Investors (OFIs) in Los Angeles, California. 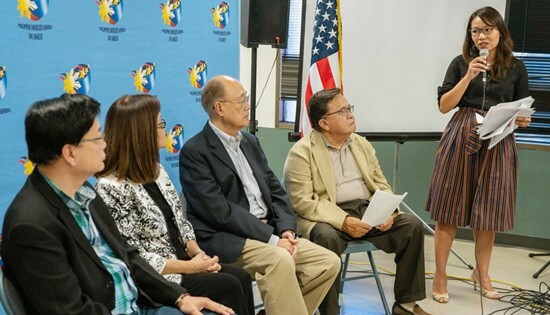 Participated in by more than fifty (50) professionals, food trade entrepreneurs, and representatives of Filipino-American organizations, the workshop was graced by Consul General Adelio S. Cruz of the Philippine Consulate General, Los Angeles. The seminar also served as an avenue for the announcement of the establishment of the TNK clinics as part of the Consulate's regular program in collaboration with PTIC-LA. The TNK clinic is set to be a monthly workshop for OFIs of PTIC-LA. Meanwhile, Trade Commissioner Celynne Layug provided updates on the Philippines’ overall economic performance and the DTI’s 7Ms strategy for MSME Development which include mindset, mastery, mentoring, markets, money, machines and models of business. Trade Assistant Rowena Namay further shared the available resources in Negosyo Centers located in various regions and provinces in the Philippines. The seminar also featured a panel discussion on “OFIs as catalyst for growth.” Panel members include APR Consulting, Inc. Founder and CEO, Ms. Linda Stone; Sual Global International, Inc., Owner, Dr. Edgardo Arcinue; GMB Management Services Global, Inc., President Mr. Armando Bartolome; and Asset Laboratories Finance/Administration Representative Mr. Eduardo Romualdo. As professionals in their respective fields, the panel members shared their insights and experiences on the various opportunities and learnings in starting a business in the Philippines with respect to services, testing, livestock/manufacturing, and franchising. Trabaho, Negosyo, Kabuhayan (TNK) is a new government blueprint for decent job creation through employment and entrepreneurship. It was a joint effort of the Department of Trade and Industry (DTI) and Department of Labor and Employment (DOLE).